160 pages | 130 B/W Illus. Sections contain introductions to basic concepts underlying the fields addressed and a specific bibliography relating to each field. Each experiment provides detailed instructions in a user-friendly format, and can be carried out, in most cases, without the need for expensive instrumentation. 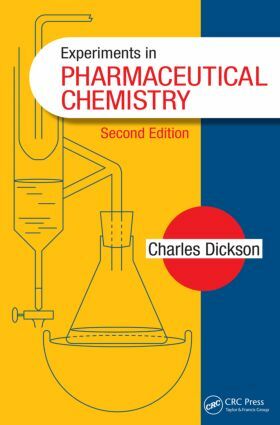 This comprehensive laboratory manual offers much-needed instructional material for teaching laboratory classes in pharmaceutical chemistry. The breadth of subject matter covered provides a variety of choices for structuring a laboratory course. Dr. Charles Dickson holds degrees from the University of Tampa, Wartburg Theological Seminary, Stetson University, and the University of Florida. He has retired after more than 20 years as a chemistry instructor in the nursing and pre-pharmacy program of Catawba Valley Community College in Hickory, North Carolina. During his doctoral study at the University of Florida, he held a National Institutes of Health fellowship in pharmacology. He is the author of three previous chemistry laboratory manuals, two for introductory courses and the third in medicinal chemistry. His articles in healthcare and alternative medicine have appeared in Your Health and Mother Earth News magazines, and he formerly wrote a syndicated column on these topics for the New York Times.